JEREMY CORBYN Addresses Annual Labour Party Conference 2017. Remember our Labour Manifesto? Gender Pay Gap must End. Education must be free. “Austerity” has been a Tory scheme to pay Billions to Elites by siphoning single Pound notes out of the Pay envelopes of Millions of Trade Union Workers. JEREMY CORBYN Personal Interview after the Brighton, U.K. Labour Party Conference on the hit BBC Andrew Marr Show. Host Marr admits dismissing Jeremy as “un-Electable” during recent Summer Election Campaign. LABOUR PARTY Annual 2017 Conference in Brighton, England, U.K. “Going Underground” host interviews Shadow Labour Ministers for Treasury (Chancellor of the Exchequer), et al. Pie – Socialism Strikes Back! Every child could be a Poet, a Musician, or anything they want to be. Jimmy Dore Show – BREXIT Good? JEREMY CORBYN, LABOUR PARTY vs.
Is Mainstream MEDIA BIASED Against Labour Party Leader, Jeremy Corbyn? 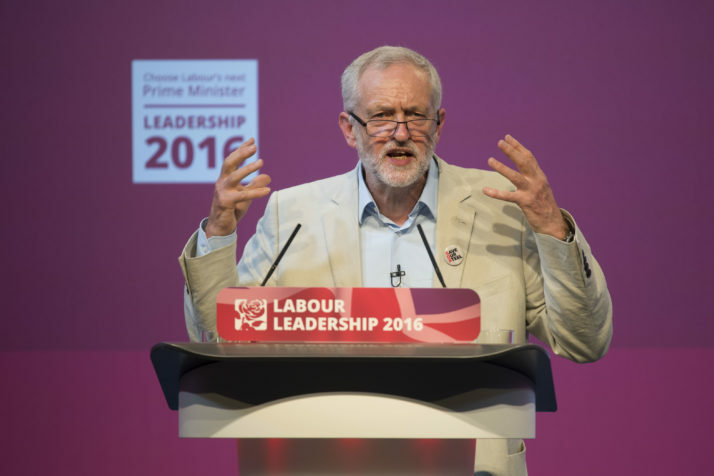 LONDON — To his critics, Jeremy Corbyn is little more than a socialist throwback to the 1970s. But to the army of young, tech-savvy activists driving the U.K. Labour leader’s reelection campaign, Corbyn represents a break from the past rather than a return to it. His policies might be retro, but the methods are anything but. This week the Labour leader’s campaign will launch a series of initiatives straight out of the Sanders playbook. Corbyn’s inner circle was on Tuesday putting the finishing touches to a “barnstormer” series of town hall meetings designed to dramatically ramp up the number of volunteers working on his campaign. The move is a direct copy of Sanders’ influential barnstormer meeting circuit, organized on social media and attracting thousands of volunteers. The concept is simple: Instead of recruiting a limited number of paid campaigners to organize door-knocking and handing out leaflets, cut out the middle men. Meetings are arranged and advertised online and volunteers who attend are quickly trained to become the ground operation themselves, taking on and organizing major aspects of the campaign. 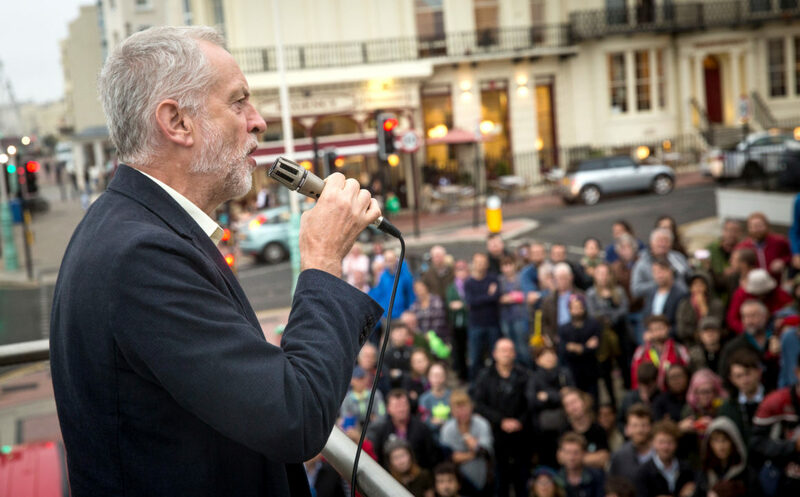 At one early barnstormer meeting in Brighton, hundreds of activists showed up to hear from Corbyn’s team. Following the event the campaign had an activist on the ground in every part of the city. In a second move taken straight from the U.S., the pro-Corbyn campaign group Momentum will this week launch a major crowdfunding drive with the money raised going straight to the Labour leader’s reelection bid rather than to the Labour Party itself. It will be the first major U.S.-style fundraising drive in the U.K. for leadership bid rather than a general election. Local Momentum groups will “compete” to raise the most money in small donations from activists in a bid to blow Corbyn’s rival Owen Smith out of the water. In the first week of the recent attempted coup against Corbyn by Labour MPs, Momentum raised £11,000 a day, with the average donation just £7.30. It now hopes to ramp up the fundraising drive by using online crowdsourcing. “The Corbyn campaign certainly cannot easily be pigeonholed into the old Trotskyite box,” said Paul Hilder, founder of the political crowdfunding website Crowdpac, who spent weeks embedded with the Sanders campaign earlier this year. Hilder is cited as an inspiration by some of the leading figures in Momentum for his work on political campaigning. He stood to be Labour general secretary in 2011 in a bid to overhaul the way the party operates and was involved in setting up the left-wing campaign website 38 Degrees. He was also a vice president of the giant U.S. petition platform change.org. Hilder insists there is only one side of the Labour Party embracing the U.S.-style social media revolution in political campaigning championed by Sanders and before him by Barack Obama. “We are seeing Momentum trying out some of the most innovative techniques pioneered by the Sanders movement,” Hilder said. In contrast, the Labour mainstream has become “professionally incompetent,” he said. James Schneider, senior Corbyn campaign organizer and Momentum activist, flew to the U.S. to study the Sanders campaign in April and describes Hilder as “a big influence” on his campaigning. Schneider rejected claims that Corbyn’s takeover of the Labour Party was a hard-left coup. “It’s not a takeover, it’s a revitalization and a modernization of the party,” he said, speaking outside Momentum’s offices in central London. Corbyn’s leadership campaign has become increasingly reliant on Momentum following a technical ruling from Labour HQ that anyone in Corbyn’s office paid out of party funds cannot also work on the reelection bid. That means a host of Corbyn’s closest aides have, effectively, been stopped from campaigning. 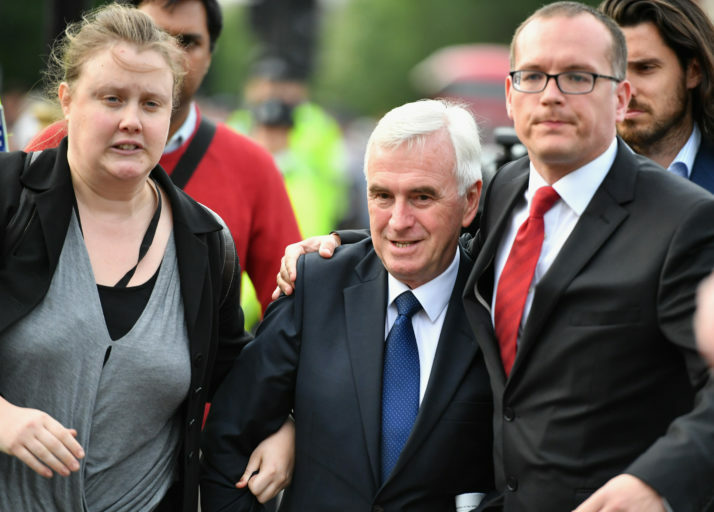 John McDonnell, the shadow Chancellor, cannot be stopped from campaigning as an MP and is acting as chairman of Corbyn’s bid. But McDonnell’s press aide James Mills has been forced to resign in order to move over to the campaign. Jack Bond, who covered social media for Corbyn, has also left the leader’s office to help the reelection strategy. Even relatively junior administrative aides have been affected by the ruling. Corbyn’s political secretary Laura Parker and diary secretary Ayse Veli have asked the party if they can liaise with the campaign for “security and logistical reasons” to keep track of Corbyn — but have yet to be given clearance. But the senior party figure, speaking on the basis of anonymity, admitted the feeling Corbyn’s supporters had of being involved helped engender a sense of enthusiasm. The figures are certainly impressive. Since Brexit, Momentum estimates 25,000 people have attended around 40 pro-Corbyn campaign rallies, even though the Labour leader has only been at a handful of them. In contrast, during the entire 2015 Labour leadership election, 60,000 turned up to Corbyn campaign events. The numbers point to an increase in enthusiasm for his leadership over the past year. At one rally in Leeds, a Momentum organizer filmed the queue of supporters waiting outside to hear Corbyn speak. The video was uploaded onto Facebook nine minutes later and seen 250,000 times within 15 minutes. Pro-Corbyn channels on Facebook have racked up 18 million views, with 3.5 million shares, likes and comments. 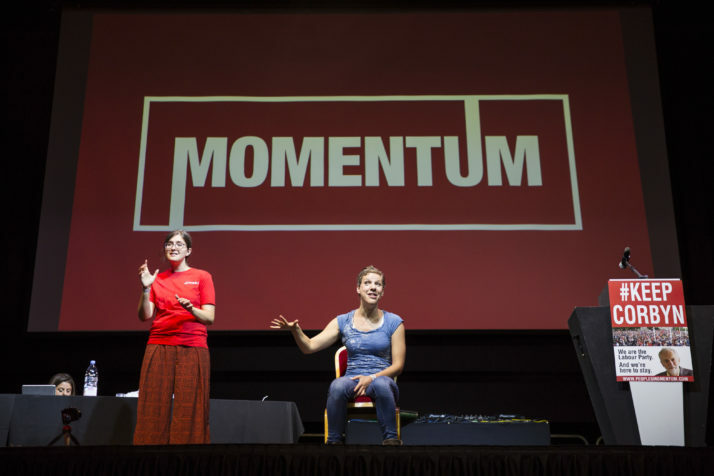 Momentum itself is now a political force to be reckoned with, with 15,000 paid members and 160,000 supporters, making its membership larger than the Conservative Party. Skeptics could be forgiven for asking why so many young graduates in the U.S. and U.K. are flocking to support white, male socialists who have passed retirement age. Even if Corbyn fails to win over the wider public, his approach to campaigning may outlast his leadership of his party.